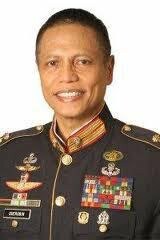 MANILA, Philippines — The Department of National Defense on Thursday said that they would look into the claims of retired Marine colonel Ariel Querubin that former president Gloria Arroyo had arbitrated in behalf of the Ampatuans when authorities seized a cache of high-powered firearms in 2006 that was meant for the powerful political clan’s private army. According to DND spokesman Eduardo Batac, Querubin’s narrative was a welcome development for the military and the defense department, adding that the amnesty committee, tasked to review the applications of rebel soldiers for the reprieve granted by President Benigno Aquino III, would look into the latest allegations. “This is a welcome development as far as the department and the AFP [Armed Forces of the Philippines] are concerned so that further action can be initiated as far as that report is concerned. What will happen is the amnesty committee will have to look into this and submit a separate report to the secretary of national defense with regard to this particular narrative that was submitted by Colonel Querubin, and of course there will have to be official action on this,” Batac told reporters. However, Batac admitted that the Department of National Defense (DND) is currently burdened by several issues, particularly allegations of corruption, which are being investigated by the Senate and Congress, and the stalled modernization program. “What’s happening right now is the department is already saddled with a lot of investigations and yet we are trying to speed up things like the modernization program which, in the last 15 years, has accomplished only 10 percent of it. We’d like to be able to accomplish so much more within the term of President Aquino,” the DND spokesman said. “Whatever personalities or whatever offices are involved, we’ll have to look into this but we really have to find a way so that all these urgent matters can be attended to,” he added. Querubin, a recipient of the military's highest combat honor, delivered the narrative Tuesday when he filed for amnesty. Querubin was among those implicated in various failed power grabs against former President Arroyo. In his testimony, Querubin said Arroyo had allegedly helped former Maguindanao governor Andal Ampatuan Sr. when a large cache of firearms, believed to have been intended for the political clan’s private army, were intercepted by the military in 2006.